Keep in mind that hair and eye color are determined at birth, just like the color of teeth and susceptibility to decay is also unique to each individual. 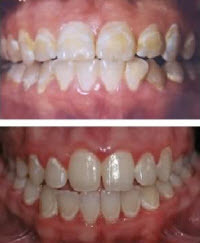 What causes white spots on teeth is different for everyone. At Kristal and Forche Orthodontics, our goal is to educate all our patients and parents on how good oral hygiene and diet impact your dental health during orthodontic treatment. Let’s all work together to create beautiful smiles that last a lifetime!